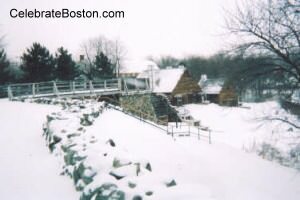 About twelve miles north of Boston is the Saugus Iron Works; designated a national historic site in 1968. The Saugus Iron Works was the first successful integrated foundry in North America, and operated from about 1648 to 1665. The works is comprised of a reconstructed blast furnace, forge, and rolling mill. The site also includes a rebuilt 17th century house, and a museum building with archeological artifacts. A half-mile nature trail, and picnic tables, are also within the grounds. The following describes how the foundry operated: Iron ore, charcoal, and gabbro rock, were carried across a small wooden bridge and dropped into the top of the blast furnace. Two large bellows, powered by a large waterwheel, forced air into the furnace, melting the iron ore and burning off any impurities. Molds were placed next to the furnace and cast iron tools such as pots, pans, or anvils were instantly manufactured. A channel at the bottom of the furnace also allowed molding of iron bars. These cast iron bars were then dragged to the forge, where they were hammered (forged) into stronger wrought iron "merchant" bars. Some of the merchant bars were brought to the rolling and slitting mill, and cut into smaller rods to be used for products such as nails or saw blades. The origin of the Saugus Iron Works dates to 1641. The growing colonies needed a constant supply of manufactured iron products. The colonies were rich in raw materials, but poor in hard currency (gold and silver coin for trading purposes). John Winthrop the Younger, son of Governor Winthrop, traveled to England and subscribed investors for a new foundry in Massachusetts. Winthrop also gathered materials and workers for the new venture, and sailed back to America. A blast furnace was initially built in Braintree Massachusetts in 1644, but quickly failed due to a shortage of raw materials. Richard Leader replaced Winthrop in 1645, and soon after the Saugus site was chosen for the new works. The Saugus Iron Works operated at capacity from about 1648 to 1665. Production dwindled until about 1675, and the site was completely abandoned by 1678. Research indicates the foundry was never profitable, but the expertise gained from the operation fanned-out throughout the colonies and helped feed the great appetite for iron products in America. Local residents initiated research into the historic site in 1943, which led to a complete archeological dig in 1948. The buildings were completely reconstructed and eventually opened to the public in 1954. The National Park Service acquired the Saugus Iron Works in 1968, and designated it a national historic site. During the summer, the waterwheels operate. The furnace itself is not operational. The reconstructed buildings accurately represent the works as they stood in 1650. The on-site museum contains relics found in the archeological dig, with an interesting short film about the site's history. Public transportation is available to the Saugus Iron Works. MBTA Bus Line #430 operates from Malden Center Station (Orange Line) and stops a couple of blocks from the works. The bus ride takes about 35 minutes each way. The bus may bypass the works at certain intervals, so check the current MBTA bus schedule before departing. Trivia: What was the original name for the Saugus Iron Works?